Heaw th' Audley miners fowt wi' death in t' surges undergreawnd. Just over two years ago, Brenda G very kindly sent me a photo of the headstone of William Dodd and his wife Elizabeth. It was lying flat on the ground in the churchyard of St James, Audley - I suppose since William had no surviving children, there was no-one to maintain it as time passed. Most of you will recall that William was one of the undermanagers at Diglake Colliery, and it was largely due to his prompt actions that over 40 men and boys were saved who would otherwise have perished along with their 77 colleagues. He later received the Albert Medal (gold class) from Queen Victoria herself at Windsor Castle. In 2006, I came into contact with Ernie, the editor of the Audley Community News, and he was kind to enough to as me to write an article about William Dodd, which was subsequently published in three instalments. I also sent him Brenda's photo, and he also started a fund to try and have William's headstone repaired, as he felt that such a man deserved better than to have his last resting place fall into ruin. 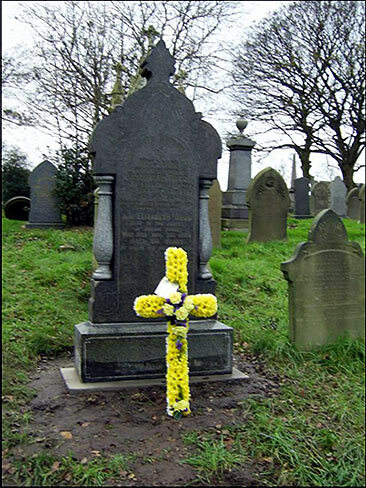 I am very happy to be able to let you know that Ernie has been successful in his efforts, and today the grave of William Dodd and his wife has been fully restored to its original state. Attached is a photo which shows this, and I believe a similar photo will appear shortly in the Community News. William Dodd died 100 years ago this year; he was an ordinary man from humble beginnings, but during those few crucial hours of the morning of Monday, 14th January 1895, he was able to show his true colours. And despite the recognition he received at the time for his actions, he remained a modest man, living a quiet life and describing himself only as a 'retired miner'. Congratulations to Ernie for a job well done! To the comforting glow of the fireside warm, Think what the coal has cost!" Around 238 men and boys were at work in the pit that morning. Of these, over 100 were working in the West 8 Foot seam, 14 or so in the West 8 Foot Boundary workings, around 50 in the East 7 Foot seam (Elsby'sarea) and just 25 in the new East Ten Foot seam, which was being extended. The fireman, William Sproston, fired a shot in the new Ten Foot at around 11.30. His son, Bill Sproston, who had just started down the dip on an errand for his father, described a sound 'like thunder' and seconds later he was washed away by a torrent of water. In the West 8 Foot Seam, at the lowest level of the pit, 12 men were killed - presumably drowned. In the new East 10 Foot Seam, 25 men were lost, and in the East Seven Foot Seam, all 40 men were lost. In the latter two cases, it is possible that these men were cut off by the rising water and died as the air became bad. 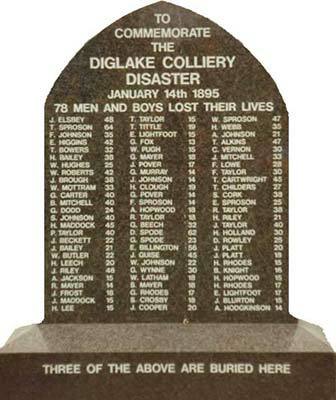 The Diglake Colliery memorial at Bignall End lists 78 names. With this as a starting point, I have collected information from three other sources: The Database of Mining Deaths, North Staffordshire Coalfield and FreeBMD. Using this information, I have tried to identify the men in both the 1881 and 1891 census returns. (NB the pages covering Wood Lane are missing from the 1891 census). In some cases, confirmation of their identity is provided by details listed in the Diglake Disaster Fund Account Book. In some cases the age listed by these sources is different to the age listed on the memorial itself. Most of the men were not employed directly by the mine, hence the mine managers had little information about their ages. All of the deaths were registered in the Newcastle L disctrict in the June quarter of 1895, after the inquest which took place in February 1895. Click on each of the names below to find out more about each man. 78 or 77? The memorial at Bignall End has 78 names. However, the account book of the Diglake Colliery Disaster Relief Fund and the Official Report to HM Inspector of Mines list only 77. On the memorial, E Lightfoot is listed twice - he had been seen in two different areas of the pit that morning. The memorial also lists an H Rhodes twice, in the last column. The Diglake Disaster Relief Fund Account Book shows only one H Rhodes and lists an Alfred Rhodes who died aged 17. George Walter Thompson is listed on the memorial as G Rhodes. The victims' families received money from the Diglake Disaster Relief Fund. In an era before the Welfare State, this was often all that stood between a bereaved family and the workhouse, once the main breadwinner was gone. To help understand how much the families received, I have listed below what the sums from 1895 would represent today. £10 in 1895 is roughly the equivalent of £745 today. £20 in 1895 is roughly the equivalent of £1500 today. "In late August of 1932 in a new mine that formed part of the Jamage colliery, the skeleton of a mineworker was found. At the inquest that followed the Pathologist gave the opinion that the man was between 27 and 32 years of age and had probably drowned in the Diglake inrush. Between January and March of 1933 a further two skeletons were found. At the reconvened inquest the coroner was reluctant to give a name to any of the remains, as he thought it could result in a terrible mistake. 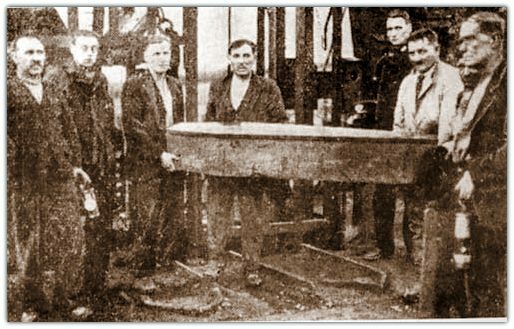 In the above photograph a group of men can be seen with a coffin used to remove the remains of one of men who perished in the Diglake disaster." "Meanwhile mining operations at Diglake had been transferred to a new pit at Rookery, several hundred yards to the northeast and it was from this pit in 1932, 37 years later that a heading was driven in the general direction of the abandoned mine. After drawing off considerable quantities of water, the vicinity of the 1895 disaster was reached on August the 12th, 1932. Further exploration was then postponed because of accumulations of firedamp. It was not until September 3rd that it was considered safe to proceed. The same morning the searchers came across the skeleton of a man. It was lying on its left side with the right arm extended above the skull. There was a clog on the right foot, and, inside the clog piece of stocking. Apart from a few remnants of a leather belt and four trouser buttons, there were no other remains except the bones, and no means of identification. H.M.I. of Mines said no action was to be taken until the approach roads had been re timbered and made good. Then the skeleton was brought to the surface in March 1933.Dr. Riley of Audley gave medical evidence, to the effect that the skeleton was a well-built male of about 28yrs, and 5 feet 8 inches in height. Subsequently, two more skeletons were recovered. Caleb Johnson, while engaged in cleaning up No.2. Road of the Ten feet seam at 10.30 a.m., came across a powder can and, further on, a skeleton. Dr.Riley said it was impossible to identify but appeared to be a man of about 40yrs. On March the 6th, another one was found and brought up next day. It was decided to abandon any plans to explore further and the road way was sealed up, leaving the remains of the other 72 to rest for eternity in the place where they died." The three men recovered in 1932/33 are buried beneath the above memorial in the churchyard of Audley Methodist Chapel.